For many years, the library community has been highly critical of the costs charged by journal publishers, especially commercial ones. The chart displayed here is based on data provided in Library Journal and shows year over year increases in science journal pricing. Because of increasing journal costs librarians now often face the arduous task of identifying journals that their budgets can no longer accommodate. 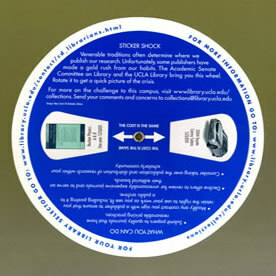 The "sticker shock" wheel displayed here reflects librarians' frustration with journal pricing. For example, the wheel claims that a $23,820 subscription cost of the journal Nuclear Physics A and B could have purchased a 2004 Toyota Camry Solara. Concerning the Transactions, Adrian Johns mentions in relation to Robert Hooke, who became the Royal Society's "Curator of Experiments" in 1662, that "Hooke's diary [on display here] suggests that readers there ["at bookshops in more select parts of London"] could expect to buy issues for 6-12 d each, and less after a month or so: their value seems to have depended on whether they carried engravings, and on their being current". Use of an online calculator for historic currency values suggests in the period 1672-7, the value of 6 to 12d (pence) would have ranged between $4.66 and $10.04. The Diary of Robert Hooke M.A., M.D., F.R.S. 1672-1680. Transcribed from the Original in the Possession of the Corporation of the City of London (Guildhall Library). 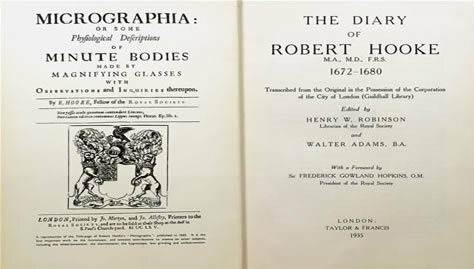 Edited by Henry W. Robinson, Librarian of the Royal Society, and Walter Adams, B.A. With a foreword by Sir Frederick Goland Hopkins, O.M. President of the Royal Society. London: Taylor & Francis, 1935. This facsimile of the Diary of Robert Hooke contains passages referencing the price of the Transactions.